During the holidays, the best beauty brands come up with luxurious and beautiful cosmetic sets that also fulfill a real need. I think the Laura Mercier Luxe Colour Portfolio Luxe Colour Portfolio is a perfect combination of product, packaging and quality - and a great item to give to yourself or to someone who loves really great makeup that truly enhances your features (It's also a $225 value!). 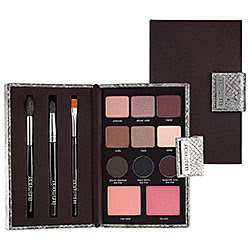 Laura Mercier Luxe Colour Portfolio Luxe Colour Portfolio contains 6 eye shadows in a beautiful array of warm shades, including African Violet (violet copper shimmer), Merlot (burgundy wine) and Truffle (deep chocolate taupe). The shadows are silky, light with beautiful shimmer and pigment. They all work together or alone and the Pony Tail mini brush (1 of 3 brushes included), is of fantastic quality and perfect to apply them with. There are also 3 Tightline Cake Eye Liners in Ground Espresso (dark brown), Black Ebony (black), Burgundy Wine (deep burgundy). These have a slightly hard consistency, but they still glide onto the eyelid easily and do last all day with no budging, smudging or fading. The shades again coordinate perfectly with any of the shadows to create very pretty eye looks. There are 2 blushes in a lighter pink Rose Petal (fresh petal pink), and a deeper pink that darker and brown skin tones can wear well, City Pink (fuchsia pink). I love the sturdy quality of the palette case, and the beautiful snake print magnetic closure (although it doesn't function as a clutch, it looks good enough to double as one in your hand). *This product was provided courtesy of Laura Mercier PR for reviewing purposes.